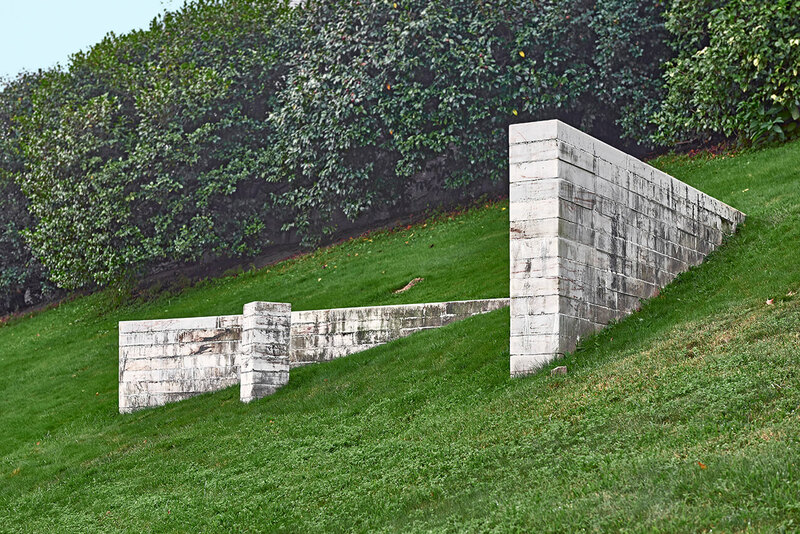 Made up of white marble blocks, Portuguese Rui Sanches’ sculpture breaks the green monotony of the park, positioned as a weathered structure waiting for the first rays of sunlight. Paradoxically, in spite of their clean, smooth surfaces, the composition of these perfect partially-buried elements look like archaeological remnants of our history, as they will come to be seen in the future. Thus, the “space for Santo Tirso” created by Sanches raises questions about permanence and existence, the appearance of forms and their conceptual relationship with history. On the other hand, this minimalistic sculpture demands a mental effort in order to imagine the scale and dimensions of an underground structure. Like an iceberg, it shows only a small fraction of an immense hidden body. Coming out in the 1980s, Rui Sanches is currently one of the main Portuguese sculptors of the last thirty years. His sculptures initially showed the influence of the geometric abstraction adopted by 20th-century avant-garde movements (Russian Constructivism in particular), especially through his use of wood and industrial wood-derived materials (plywood, chipboard and others) in combination with pipes or steel. Since the 1990s, however, Sanches has given up historic intertextuality and introduced new modelled elements, coming discreetly closer to figurative art and developing a new construction process through the addition of stratified flat layers to make up three-dimensional objects. In addition to sculpture, Rui Sanches has developed a significant body of work based on drawing, in which the freedom of intuitive gestures and the rationalism of geometric shapes are in constant, unresolved conflict.